Jugurthine War (112-105 B.C.) - After the final destruction of Carthage in 146 B.C., Numidia became the most powerful kingdom in western North Africa. It had been allied with Rome from the end of the Second Punic War when Massinissa was king, the first king of Numidia. Before him, the Numidians were largely a nomadic people, but he managed to coalesce them into a unified nation. Massinissa enjoyed a very long a prosperous reign, from 206 to 148. 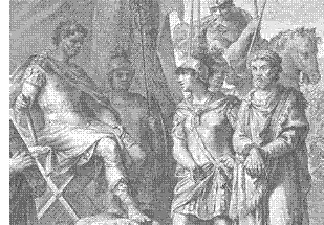 He was succeeded by his son, Micipsa, who also remained on friendly terms with Rome. But his son (adopted), Jugurtha, had ambitions of his own. When Micipsa died in 118, he and his two step-brothers all laid claim to the throne and this led to a civil war which eventually pulled Rome into the conflict. The primary source of this war is the Roman historian, Sallust. As a growing power, Rome found itself interfering in the affairs of more and more nations around the Mediterranean, as it had in the war between the Ptolemaic and Seleucid kingdoms (see Maccabean Revolt). The war resulted in the overthrow of Jugurtha; although Rome did not acquire any new territory. But it was significant for a number of reasons. First, it demonstrated Rome's growing influence and ability to dictate events in the region. And second, it brought to the forefront two personalities who would compete for power and the affection of the Roman people. They were Gaius Marius and Lucius Cornelius Sulla. Although not as famous as the rivalries between Julius Caesar and Pompey, or Octavian and Marc Antony, it preceded those two, and many historians point to the Jugurthine War as the initial event that would eventually lead to the end of the republic and the rise of the empire.